These two boys were selling their pokemon drawings in the subway while their mother was selling bootleg DVDs. 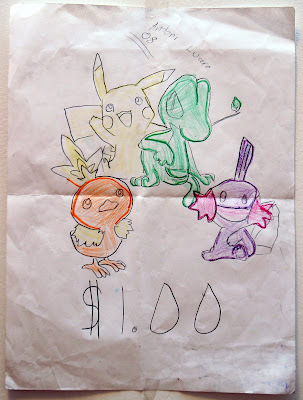 I love that the boy who drew this wrote the price right on his drawing and signed his name and the date. His face lit up when I came over and handed him a dollar that looked so huge in his little hands. Sometimes things are so innocent and beautiful that it breaks my heart in a way that I can't explain. All I want to do is laugh and cry at the same time. I want to laugh and cry with your blog. God, woman, you are so, so positive, you have lightened up my day. Thank You. I just found your blog, and I must say I AM IN LOVE WITH YOUR BLOG AND YOUR SPIRIT! There are a million posts I wanted to comment on but this post really hit home. 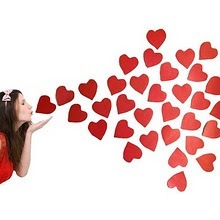 I think you REALLY are as sweet, caring, thoughtful, full of kindness and love as your posts and art convey. Bless you and thank you for making everyone around you and those of us who find your blog and randomly enjoy your art... smile. You reminded me of the joy of being carefree and innocent. I totally agree! If i were there i would cry any second. touching.